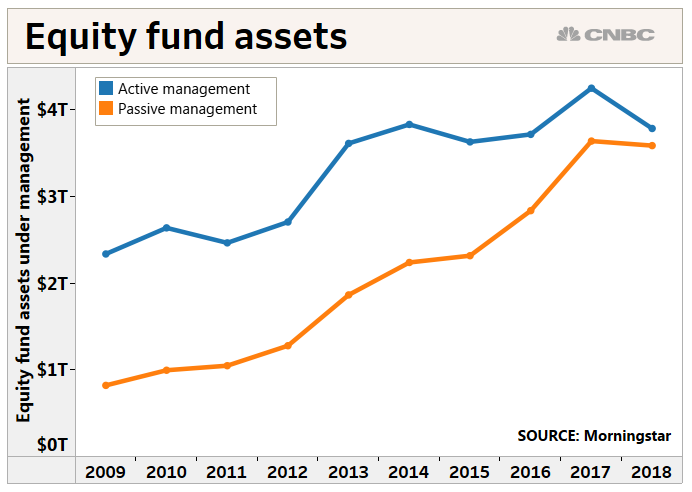 Passive management now accounts for 45 percent of all assets for U.S. stock-based funds. That's up from just around 25 percent a decade ago. Investors have turned to ETFs and passive mutual funds in large part because of their lowest cost. At the beginning of the bull run, active had a nearly 3 to 1 advantage over passive in U.S. equity funds, according to Morningstar. That gap began to narrow significantly in 2012 and has come down sharply since. ETFs generally charge much lower management fees than mutual funds, many of which employ managers to move in and out of stocks in an attempt to outperform the major indexes like the Dow Jones Industrial Average and the S&P 500. ETFs mostly follow the indexes themselves and trade during the day like stocks. Critics of the index funds say they are too susceptible to the changes in a few market-moving stocks, virtually guaranteeing that investors won't generate alpha, while also potentially posing liquidity risks in times of market stress. Despite the naysayers, it's not just stocks where passive investing is making inroads. Indexing has gained market share in fixed income broadly including both high-grade and high-yield funds, according to the BofAML data. Passive funds now have 25.3 percent of the market in total bond funds, also up a full percentage point from June 2018. High-grade index funds now have a 29.9 percent share, compared to 29.7 percent, while high-yield has increased to 13 percent from 12.9 percent. Equity funds, though, have shown the biggest gains during a period where the stock market has risen more than 320 percent from its financial crisis lows. Stock pickers have struggled to top basic index returns throughout the bull run. Some 43 percent outperformed in 2018, according to BofAML, in one of the best years since the rally began in 2009.